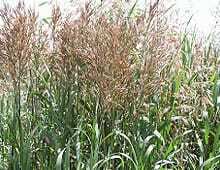 Livestock: Smooth Brome may be used for hay, pasture, silage or stockpiling. It is compatible with alfalfa or other adapted legumes. The grass is highly palatable and is high in protein content and relatively low in crude-fiber content. Erosion control: Since the plant has a massive root system and is a sod former, it can be used effectively for critical area planting and waterways if the areas can be irrigated or where annual precipita-tion exceeds 20 inches. Bromus inermis, Smooth Brome, is a leafy, sod-forming, perennial, cool season grass that spreads by rhizomes. The stems vary in height from 2 to 4 feet. The plant produces numerous basal and stem leaves that vary in length from 4 to 10 inches. Frequently, the leaves are marked by a transverse wrinkle resembling a “W” a short distance below the tip. The flower head develops a charac-teristic rich purplish-brown color when mature. The seed is produced in semi-compact 5 inch long panicles with ascending branches. The flat compressed seed is usually awnless, about 1/3 inches long, and smooth. There are approximately 135,000 seeds/ pound. Smooth Brome is the most widely used of the cultivated Bromegrasses and has been cultivated in the U.S. since the early 1880s. Smooth Brome is best adapted to cooler climates and is generally hardier than Tall Fescue or orchardgrass. It is resistant to drought and extremes in temperature. Smooth Brome is susceptible to disease in areas of high humidity. Smooth Brome grows best on slightly acidic to slightly alkaline well-drained clay loam soils with high fertility but it will also grow well on lighter textured soils where adequate moisture and fertility are maintained. Smooth Brome performs best in a pH range of 6.0 to 7.5. Stands are difficult to obtain and growth is poor on soils high in soluble salts. A clean firm seedbed is needed. Due to the slow germination and establishment of Smooth Brome, spring seedings are especially preferred in the northern states. In southern areas, late summer seedings are a second option. Fall seedings should be made at least 6 weeks before a killing frost is expected. Seeding rates are typically 5-10 pounds/acre in mixtures, and about 10 to 20 pounds/acre when seeded alone. When Smooth Brome is seeded in a mixture with Alfalfa, the alternate row method will give the best results. Seeding depth is approximately 1⁄2 inch. If broadcast increase the seeding rate and cultipack after planting.. Smooth Brome requires heavy early spring and fall applications of nitrogen to maintain high yields in a pure stand. Mixtures with Alfalfa will require less nitrogen but the Alfalfa will usually need phosphorus each year to maintain vigor. Best forage production is obtained from Smooth Brome when used in a planned cropping system and plowed out after 3 to 4 years. Its heavy sod makes it an excellent soil conditioning crop when included in cropping systems. In deep, well-drained soils, it will root to 4 feet. Smooth Brome performs best in grassed waterways, field borders, and other conservation uses where the forage can be cut and removed while in early bloom. Do not graze the new seeding; cut the first crop for hay. In Bromegrass-Legume pastures, allow the legume to go to bud or early-bloom stage before turning cattle in to avoid bloat hazard, and manage thereafter for optimum regrowth of the legume. Pastures should not be grazed prior to Smooth Brome attaining a minimum height of 10 inches at the beginning of the grazing season. Grazing pressures should be adjusted throughout the season to avoid grazing this grass to less than a minimum height of 4 inches.